Riley Surface World's range of down flow, reverse pulse cleaning (DFRPC) cartridge dust extractors includes the market leading features that ensure optimal performance at great value. Riley Surface World is using its years of engineering experience to design and manufacture high quality, great value, reliable new machinery. If we can't meet demand with used machinery Rileys is committed to providing for our customers with new machinery. This committment expands the unrivalled range and flexibility of surface finishing machinery on offer from our warehouse. Why Buy a Dust Extractor from RSW? 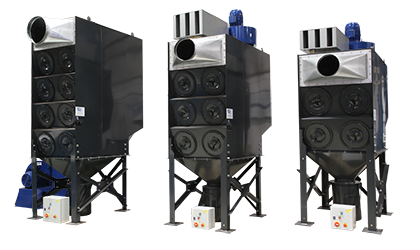 A range of brand new Down Flow Reverse Pulse Cleaning (DFRPC) Dust Extractors from Riley Surface World. Built in the United Kingdom these extractors incorporate features that we believe will rival any of the current extractors available on the market today and at a very competitive price.